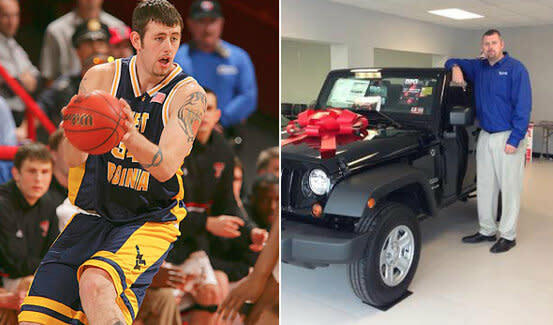 If you walk into the Miller’s Chrysler Dodge Jeep Ram dealership in Martinsburg, WV, there’s a good chance you might be helped by a sales associate who’s also one of the most well-known March Madness stars in recent memory: West Virginia’s Kevin Pittsnogle. The tattooed, homegrown Mountaineers big man possessed a soft touch both inside and out. He was the breakout star of seventh-seeded West Virginia’s dream run to the 2005 Elite Eight and followed that up the next year by helping WVU to the Sweet Sixteen as a No. 6 seed. Pittsnogle’s NBA career consisted of just six games with the Boston Celtics in 2006 after not being selected in that year’s draft. He also played in the D-League, CBA, EBA, and leagues in Puerto Rico and France before calling it quits last year and settling into post-basketball life in his hometown of Martinsburg almost as quickly and suddenly as he became a hoops cult figure. Married and the father of son Kwynsie, 7, and daughter Amyyah, 4, the 28-year-old Pittsnogle spoke with Lost Lettermen managing editor Chris Mahr over the phone about life after hoops. LL: You were initially involved in education, including working as a middle school teacher. What made you change your line of work? KP: I just decided to try something different, and I always wanted to sell cars since I was a kid. I just started selling cars a couple months ago (in December), and I enjoy doing it. It’s something I could do for a long time. LL: What led you to decide to retire as a player and return to Martinsburg when you did? KP: I kind of put myself on a time limit. I gave myself five years to see what I could do, and if I hadn’t situated myself in basketball by then I was going to come back home in time to see my son start school. I wanted to settle back into life here because the kids became more of a priority than basketball. LL: Do you still play recreationally in your free time? KP: I don’t get to play at all since my kids take up almost all my time. I try to spend as much time teaching them how to play sports and other activities. [Kwynsie] plays every sport, including basketball. LL: Is basketball his favorite sport? KP: Honestly his favorite thing might be bowling. He bowls in a league now. He’s okay at every sport, and as he gets older I’m sure he’ll find one that he really likes. LL: Is there any difference in how folks in Martinsburg regard you now compared to when you were growing up there? KP: There’s absolutely no difference. Everyone knows me as a laid-back type of person who doesn’t go around saying or doing anything [because I played basketball]. I talk to people all the time [about it], but nothing’s drastically changed. Other places in the state, it’s different. LL: How often do you stay in touch with then-head coach John Beilein and your former West Virginia teammates? KP: I’ve talked to coach Beilein once or twice a year just to say “hi.” He contacted me this summer, in fact, to see how things were going. He’s the type of coach that stays in contact with his ex-players. Periodically the other players and I talk through Twitter and Facebook, but some of them I haven’t talked to since college. Not because we weren’t friends but because they’re in other countries or other parts of the country, and it’s hard with everybody being busy. LL: How satisfied are you with your basketball-playing legacy and how your life’s turned out in general? KP: I’m extremely satisfied with where my life’s at right now with my kids and everything that’s going on. And I’m extremely happy with everything that happened at West Virginia and after college, the experiences I had and places I got to see. Things couldn’t have turned out any better for me.